Two very good pieces of news at the hospital today. Firstly, my DNA results are back and I don’t have the same mutation as Pudding, so it was a spontaneous change on his X chromosome. If I did have another son (which definitely ain’t gonna happen!) there would apparently be a slightly higher chance of MPS than in the general population but not the 50% chance of a carrier. It also means that other family members should be in the clear. Secondly, after 18 weeks, we have finally been cleared for home treatments. We had no untoward temperature rises again today, so the combination of medications and slower infusion rates is doing the job. We’ve been sent home with a bag full of prescription potions, our medical fridge is already in place and assuming there is no hitch with arranging the delivery of the precious Elaprase (enzyme) we should be able to have the treatments at home starting next week. So no more packing bags the night before. No more waking Pudding up early and giving him breakfast in the car. No more long commute (though this has definitely been easier the last few weeks using a volunteer driver from Patient Transport – these people are amazing). No more sitting in a hospital for hours. Instead we’ll be here and Pudding will be able to move around more with a mobile pump, while I can get on with other exciting things like the washing up. 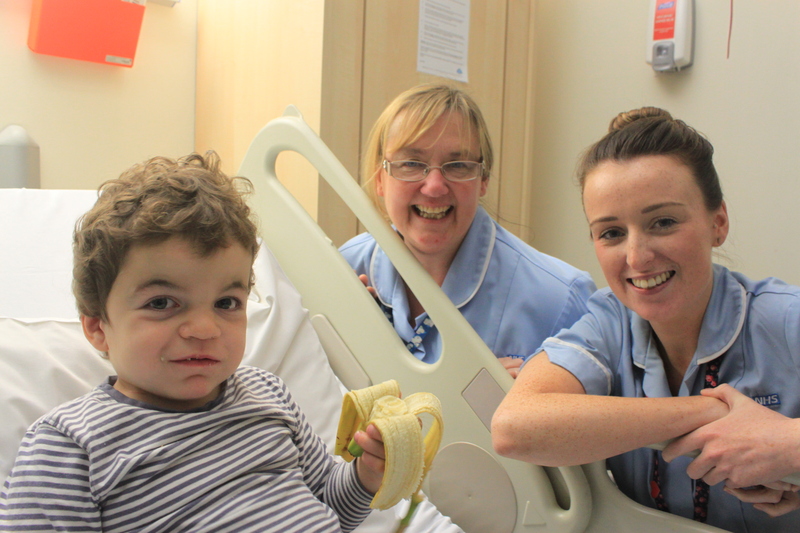 It will be sad not to see the lovely nurses every week – but we will be back there again soon for clinical trial screening (more on that another time). And we’ll have other lovely nurses here instead. And then this evening there’s a letter in Twiglet’s school bag explaining what activities they have on in the run-up to Christmas, and my eye is immediately drawn to the paragraph on the school play – ‘Following each performance we will be collecting donations to go to the MPS Society, a charity very dear to one of our families.’ Of course, I cried again. Lots of tears today, but happy ones for a change. Now excuse me while I go shout from some roof-tops and do a tap-dance round the living room. Can you tell how happy I am?! If…and I have to keep repeating this one to myself… if, Pudding’s temperature behaves itself again this week, we will be able to start having infusions at home. Trying so hard not to get too hopeful about this one. In other news, I saw a lovely man at the hospital last week. He made me laugh, and he made me cry. I’ve never seen a psychologist before, or indeed anyone working in that sort of field, so I wasn’t at all sure what to expect. I’ve had times over the last six months when I’ve wondered whether I was depressed. Mostly I’ve come to the conclusion that I’m not – just dealing with something monumental. But of course, I’ve got no real experience, so it was good to have someone outside it all to say, ‘You’re reacting entirely normally.’ And because he has worked with the Willink team for many years, he knows all about MPS, so I didn’t have to explain a thing. It was such a relief to meet someone new, and have him look directly in my eye and say what a horrible thing it is that we’re facing. So often people mean well, but just don’t know what to say, and I find myself helping them out, brushing aside my own feelings to ease the conversation past this uncomfortable bump. Not that I blame them at all – I know I’d have had problems myself before all this. This is, I suppose, the benefit of all the talking therapies – the chance to be freed of all the constraints of normal conversation. To say things that you keep hidden from almost everyone else. To be challenged. He tried, and failed, to get me to say out loud that I was doing a good job. And I was surprised by how difficult I found that. Because I know deep down that I really am. The session reminded me of all the times in my life that I’ve lacked self-belief. Times when I have taken the easy road to avoid having to face things. Times when I have resisted change. Times when I was scared that I’d be found out as a fraud who doesn’t really know what she is doing. But this time, there is no easy option. I can’t avoid this one. I know I will do a good job. For my family, for both my boys. And for me. Because if I don’t, things would be a whole lot worse for everyone. So yes, Stewart, although I may still have difficulty saying it out loud, I am doing the best I can. And yes, I will ace it. I’m sure that any parent of special needs children will tell you that it’s a roller-coaster of a life. Probably even more so when the diagnosis is of a progressive, life-limiting disorder. That’s certainly been my experience so far anyway. I’ve been through many emotions in the last few months: disbelief, dawning realisation, depression, anxiety, anger, devastation, guilt… You name it, I’ve been there. Last week was not a good one, but this week I feel lighter again. A meal out to celebrate the end of the play I was in. A bit of sunshine. Talking with a good friend. Baileys hot chocolate. Cuddles with my boys. All these things make a difference. And then there was the news. Often full of horrible depressing events here and abroad – so I confess I mainly avoid it. But lately there have been two wonderful things pop up in my Newsfeed. First was a young girl with leukaemia who has shown good progress after a pioneering treatment involving gene editing. And second was the announcement that researchers have used ultrasound and microbubbles to breach the blood brain barrier and allow a brain tumour to be treated. Obviously both these cases are very different from the situation we are facing, but it’s a start. Medical advances can and do make huge leaps. So for the first time since July, this week I looked at Pudding and said, ‘You’re not going to die.’ OK, so I know I can’t really affect the outcome. Whether a cure comes in time for him is still very much unknown. I’m not kidding myself. When I look at Pudding, I see a boy who is busy enjoying life with such vitality and commitment. His warmth draws answering smiles from anyone, and he always has loads of hugs to offer. It may not always be this way, and I know there will be plenty of times that I rail against this horrible condition; when I will see those who are becoming friends lose their battle against it; when I resent anyone who has never been a regular visitor to a children’s hospital. But for now I choose to remember the words they told me when I first rang the MPS Society – he is the same little boy that he was before diagnosis, and enjoy him for that. I choose to get busy living. One of the questions I found the most difficult to answer was back in August. Pudding was having a slight reaction during his infusion, so they needed to get a doctor to sign off some extra meds. I looked at her, utterly confused, and garbled something about a range of different things but mainly his development. Five minutes later I told the ERT nurse what she had asked, and she explained that all the doctors change over jobs in August, so it would be someone who had never come across MPS before. It brought home to me that now I will always be more of an expert on MPS than the vast majority of people I come across, including medical professionals. Having completed three months of enzyme infusions and been through most of the initial assessments, now seems to be as good a time as ever to answer that question though, and take stock of the effects so far. Physical appearance – he has the usual Hunter appearance – chubby cheeks, large forehead, broad nose – that tends to get more obvious as they grow older. His tummy is big due to the increased size of spleen and liver (this may reduce with the ERT). Ears – those with Hunters are particularly prone to hearing problems. Pudding had persistent glue ear both sides. Since grommets were done in August, his hearing has definitely improved, and they will probably have to be repeated again in the future. Skeletal issues – He is tall at the moment; without treatment growth would normally slow down around now and stop at just over 4 foot, but with ERT it will probably continue to give him a normal height. Movement at his hips and shoulders is reduced; this doesn’t give him many problems at the moment, but he is often stiff after a period of inactivity and it contributes to his characteristic running style! At rest, Pudding’s fingers tend to curl over slightly though they can still straighten at the moment. Whilst ERT stops further build up of GAGs in his joints it cannot reverse any damage already done, so all these problems are likely to worsen. Clawed hands are very common, along with carpal tunnel issues. X-rays didn’t show too many problems, but we are awaiting an MRI which would look in more detail at the formation of the vertebrae in the neck. Teeth – widely spaced and odd shapes. Brushing is a challenge due to his inability to stay still! Airways – he has always been a noisy breather, particularly at night. A sleep study showed quite a lot of dips in oxygen saturation, but this has improved since adenoids and tonsils were removed in August. His airways apparently didn’t look too bad, so hopefully diagnosis came before too much damage on this area. Smaller airways and shorter necks in Hunter Syndrome can make it challenging for anaesthetists during a general anaesthetic, so this will remain something that we worry about. Heart – his heart muscle is slightly thickened and some valves affected by buildups of GAGs but so far the heart is still doing its job effectively. Bowels – doing a lot better since the start of ERT! Speech and language – while Pudding still tends to use single words and a lot of babble, phrases are beginning to surface. ‘Where’s the baby?’ was a recent sentence that he wowed me with. Vocabulary is improving and his understanding is so much better than a year ago when we started down this route to diagnosis. We’re using and trying to teach him Makaton, to help him improve his communication and leave something if he loses his speech later on. Behaviour – discipline can be really difficult. Lately though there have been a few breakthroughs – the word ‘sorry’ can even be heard sometimes. In one of the leaflets I have it describes younger children with Hunters as ‘cheerful, overactive and strong’. Pretty accurate! Behaviour can get a lot more unpredictable and aggressive as the disease progresses. Seizures – we haven’t had any yet, but they occur in about half of severely affected children so it is one more thing to look out for as the years go on. I could write more, but that is venturing into the realms of the future rather than what we can see right now. Whilst we obviously worry about all that we are facing, there are still hopes at the moment. Hope that we can get on the clinical trial, hope that brain involvement can be slowed or halted and hope that gene therapy can eventually provide the answer. They are small hopes – it pays to stay realistic – but we have come so far already. I look at Pudding these days and know that things could be so much worse. Ten years ago, ERT was only in trial and it has made such a difference to many. Who knows what the next few years could bring? Every time I think I’m coping well again, it seems like I get hit back down. I’ve avoided posting on here in the last few days because I was well and truly in the slough of despond. Nothing seemed worth the effort and I was crying every day. My hair was shaved off, my release of doing the play was over, trips to Manchester would be continuing and we would have to stay there for longer as the infusion rates would be slowed down. Filling in a form the other day I was stymied by the question ‘What do you want for your child in the next 3-5 years?’ I sat and stared at it for minutes, tears gathering again. I couldn’t write on here. Even I was getting fed up of my misery, let alone any poor souls who are reading this. A few other MPS mums have said to me recently that the first year is the hardest. I have to keep reminding myself that it is only four months since our world was turned upside down. Six if I count from when the pediatrician first mentioned MPS. It’s no wonder that it is hard still. So why am I writing now? I’m on the up again. And perhaps strangely it’s because of the trip to Manchester yesterday. Yes, it was a longer day – we set off at 7.15am and didn’t get back till just after 6.30pm. Yes, it’s hard at times to keep Pudding content while stuck on a bed for over 4 hours. But the upside is I got to spend the day with two wonderful people. I remember many moons ago there was a TV series about nurses called ‘Angels’. I never thought much about that title at the time, but now I know how true it is. All the team that we get looked after by in Manchester are amazing. They help parents like me through the most difficult times. They understand. They listen. They push me out the door to go get a drink. They hold me tight through the tears. They look at Pudding with love and tenderness. They manage appointments and do everything they can to make things easier. I’ve always been a middle ground sort of person. Ask me to rate a service and I’ll never give the extremes, but would always choose the less definite ‘good’ or ‘poor’. Yet, filling out the feedback form for their upcoming assessment by the Care Quality Commission, there was no doubt in my mind that 5 out of 5 was the minimum that I could give on every single question. I honestly don’t know how I’d have got through all this without their support. Angels indeed.